Huge 3-story Victorian with covered wrap around porch and over 3500 sq.ft. of living space! 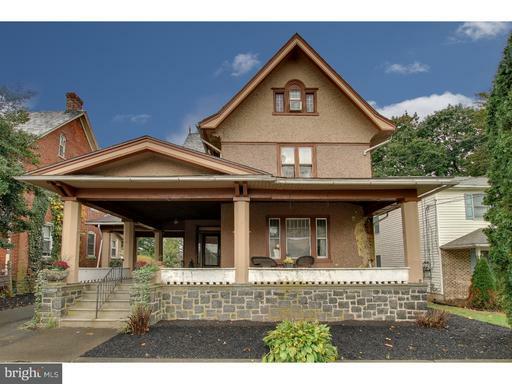 5 bedrooms, 3 full baths, plus bonus rooms throughout this wonderful older home. Stained glass windows, older architecture, 3 fireplaces throughout. Energy efficient gas heating, hot water, and cooking. Great location off of Broad St, and convenient to major routes and downtown stores. First floor offers spacious family and living rooms, den/study/office, Moravian tiled fireplace, crown molding, wider door molding, high baseboards, pocket doors leading into the den, sliding barn door into the dining room, wainscoting, and hardwood flooring under most of the carpet. Stunning staircase with double landing, beautiful craftsmanship and architectural features not evident in most newer homes. Hardwood underneath the carpeted staircase. Full bathroom on first floor has outside access, so this could also serve as a mud room. Kitchen has plenty of cabinets for storage and has an outside entrance. 2nd floor has 3 generously sized bedrooms that you cannot find in new construction! Large master and 2nd bedrooms, and 3rd bedroom has a smaller sitting room attached. Rear staircase leads from the kitchen to one bedroom and also to two other bonus rooms that are currently being used for storage, but could potential be a play room, art room, or more. Laundry is conveniently located on the second floor. Third floor offers another full bathroom and 3 additional rooms. Largest room would be an excellent game/movie room, or even a play room. Other rooms could be used as bedrooms, office/study space, storage, or whatever else you may desire. Alley access leads to two 2-car garages, so there are 4 spaces altogether, in addition to the driveway and street parking.